Once you make up your mind about investing, it all boils down to your investment capacity, your appetite for risks, and your patience to wait until the end of the maturity period. With its fast-developing economy and huge potential for growth, India is a great nation to invest in. There’s a whole gamut of instruments where you can invest and earn great returns. Once you make up your mind about investing, it all boils down to your investment capacity, your appetite for risks, and your patience to wait until the end of the maturity period. A non-resident external rupee account (NRE) fixed deposit account is one of the best and most basic options for NRI investment in India. You can earn a decent interest of up to 8.5% on it. The same applies to your foreign currency non-resident bank deposits (FCNR) as well, where your interest is based on the currency you deposit. Also, the interest you receive from both these accounts is totally tax-free in India. A non-resident ordinary rupee account (NRO) account would fetch you an interest rate that ranges anywhere from 4% to 7.5% based on the maturity tenure of your deposit. You can also look to invest in liquid funds and/or ultra-short-term funds. Liquid funds have a minimum holding period of about two weeks and an average debt instrument maturity happens within 91 days. It’s a low-risk option with no exit load. Ultra-short-term funds, on the other hand, come with a minimum holding period of three months and can have a maturity period ranging from a week to 18 months. It does offer better returns than liquid funds but you may be charged an exit load for the initial period of investment. This includes both equity as well as debt mutual funds. You can invest in equity MFs through SIPs. In the long run, this would get you returns in the range of 15-18%. Usually, an asset manager takes the responsibility of managing your funds. You can focus on large-cap funds and diversified funds for best results. If you wish to minimize the risk, debt mutual funds are your way ahead. It offers you liquidity with the safety of your capital. Though the returns might be less than equity MFs, you can be sure that they are safe. You can even choose to invest directly in short-term debt funds. Here, you can invest in government bonds, deposits. You also get an option to invest in Treasury bills that offer you a maturity period of up to three years. These are non-negotiable money market instruments issued in a demat form. Their maturity period ranges from seven days to a year and they are extremely liquid in nature. You can also avail CDs on a repatriable basis and can get a rate of interest higher than bank FDs. In a nutshell, short-term investment in India can be a good option if you are an NRI. With a large variety of options and funds to choose from, your returns would directly be related to your risk appetite and duration of the investment. Moreover, a stronger foreign currency would only mean that you have more capital to invest in India. 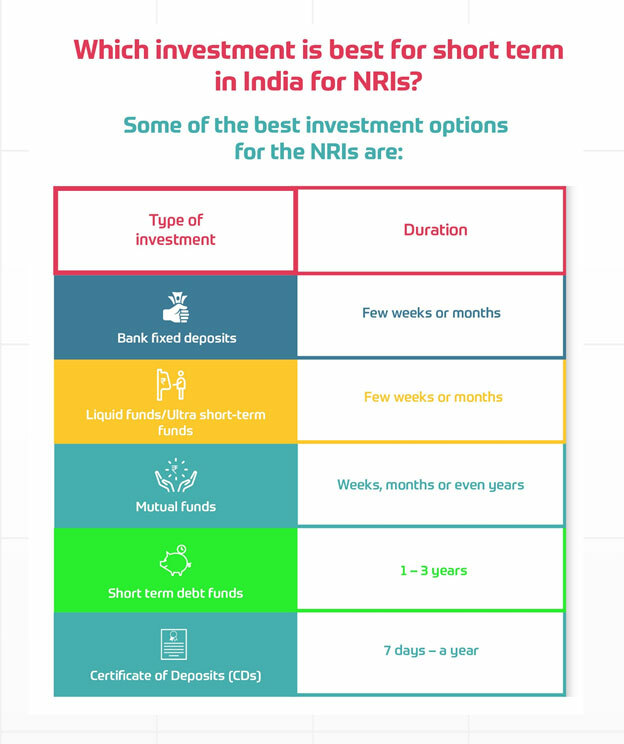 Here’s a pictorial recap of the types and duration of short-term investments for NRIs.